With the iPad 2 launch looming in the background, Motorola has apparently decided to fix one aspect that has hindered its tablet’s full potential. While Flash support was one of the Xoom’s main features, users sadly had to await an update that would unlock their device’s Flash capabilities. Thankfully, it appears that update has finally arrived as Motorola is announcing a software release that will provide Flash support for the Honeycomb tablet. According to the Motorola support forums, the update is now available over 3G and Wi-Fi connections and includes support for Adobe Flash 10.2. Also included in the update, is an improvement to daylight savings time which had previously caused problems for calendars on the Xoom. Unfortunately, users with an unlocked or rooted Xoom tablet may have to revert back to the standard Xoom software in order to receive this update. 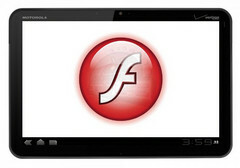 While the update does provide support for Flash 10.2, Adobe has yet to actually release that version of Flash and the latest update only readies the Xoom for the Honeycomb optimized plug-in. As a result, Xoom owners will have to hold on till the 18th of March when Adobe will supposedly release the 10.2 plug-in via the Android Market.